Most people refill cartridges using needles and syringes. While this is a great option to save money and satisfy your ink filling needs some customers wanted another option- as a result we released the MIS Squeezer Caps. Soon after the release we received feedback expressing the need for some minor improvements. You spoke- we listened... Inksupply.com is very proud to provide you the new & improved threaded MIS Squeeze Caps, now complete with an O-ring and lure lock cap. Follow these simple steps to a quick, clean and easy refilling experience. 1. Attach the needle to the top of the squeezer cap fitted with the lure lock. 2. Unscrew the original bottle cap . 3. Screw the squeezer cap onto the bottle ... FILL THOSE CARTRIDGES! These caps are for use on MIS 2 oz bottles and can be found on our accessories page. CLI8/PGI5 sets… with AUTO RESET CHIPS! I'm pleased to inform you that you can now truly have what you want. Check them out below; we have in stock cartridge kits for the printers requiring the CLI8/PGI5 set up, but now with auto resetting chips (And the crowd goes wild)!! You can skip the daunting task of moving those tiny little chips over from one cartridge to another and get straight to point of placing it into your printer after filling. The auto reset function also means you will not need a chip resetter, simply wait for your printer to indicate the cartridge is low before you complete the refill. Then, place the full cartridge back into the printer & tada, the cartridges will be recognized as full once again. F.Y.I., These cartridges are currently only available as a 4 set or 5 set and if you order an entire refill kit you will receive the cartridges needing the OEM chips. Should you have any questions or need help placing the order feel free to contact us. for each color position. Call or click any of the images for any further information or to order your system and save up to 80% on your prints today. Tired Of Ink On Your Hands? industry needless to say you will run into the issue of ink on your hands. So what does one do, you ask? Well after testing dozens of products with limited results we have found a product called Dye Gone. This product has proven to be a permanent fixture at InkSupply.com because of its effectiveness to do exactly as the name says. DyeGone Removes dye ink from your skin in a short amount of time. We have used this product on dye based ink as well as pigment ink from all of the different manufacturers and we always seem to get the same great results. inkjet prints. Print Shield protects all inkjet prints from moisture, UV, light, humidity, atmospheric contaminants, scuffing and fingerprints. Its low solids formulation maintains the original look of the surface of the print, elimating gloss differential. It is a must for every fine art inkjet print that needs protection. Also works great on photo papers and canvas. information can be found by clicking HERE. MIS Associates Inc (Inksupply.com) is offering two bundled printing solutions, for a limited time only. The R1900 bundle comes with a brand new Epson R1900 printer and a complete set of ink equivalent to 10 cartridge sets. The C88+ bundle comes with a brand new Epson C88+ printer and a MIS Auto Inking system. You will never have to buy a cartridge again. The ink included is equivalent to 10 cartridge sets. Act fast, supplies are limited and the offer ends soon. One of the largest problems with refilling cartridges for Canon Pixma printers has been the need to disable the ink monitor in the printer to reuse the cartridges. While this method worked, it made it difficult to keep track of the ink remaining in each cartridges. Now there is a better solution. 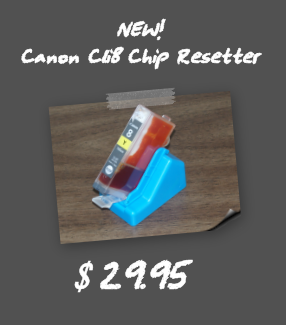 The SK155 chip resetter for Canon CLI8 and PGI5 cartridges is designed to reset your OEM cartridge chip back to full. This eliminates the need to disable the printer ink monitor, and reduces the risk of running cartridges dry. Please note that the SK155 will only work with OEM Canon chips, not aftermarket chips. New Aftermarket Canon CLI8 and PGI5 Empty Cartridges. Now in stock! Virgin empty CLI8 and PGI5 cartridges for use in Canon Pixma printers. These cartridges are brand new and come ready to be filled. Click on the image above to find the cartridges for your printer. The refill procedure for these new cartridges is identical to the refill procedure for OEM cartridges, so there is almost no learning curve to get up and running. 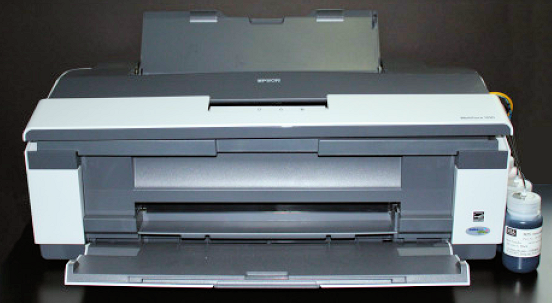 We recommend using our SK155 chip resetter to bypass the need to disable the ink monitors on your Canon printer. 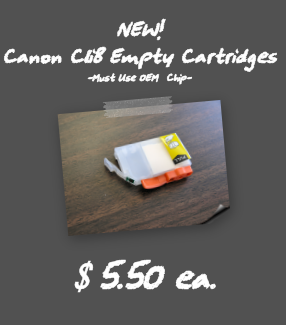 Please note that these cartridges require the use of OEM chips in order to work, so you will need to save the chips from your OEM Canon cartridges and install them on these new cartridges. New Vivid Magenta inks expand the K4 color gamut for extreme blues and purples previously outside other ink sets color spectrum. The light inks in the set allow for very smooth transitions, and even the printing of watercolors and pastels. This ink set also includes three black inks, these allow for smoother gradations that will add intense depth to your black and white printing. Note: New Vivid Magentas cannot be used with older non-compatible printers.